The Paris climate accord, also called the Central agreement for shaping globalization, a Limerick. – Len Bilén's blog, a blog about faith, politics and the environment. Will globalists fall on their sword? President Trump had an audience with Pope Francis on his first foreign trip. The Pope gave Trump his encyclical on climate change, advocating signing the Paris accord. Then in Belgium he locked horns with Nato, calling them out on shirking their responsibilities on defense, spending money fighting climate change rather than terrorism. 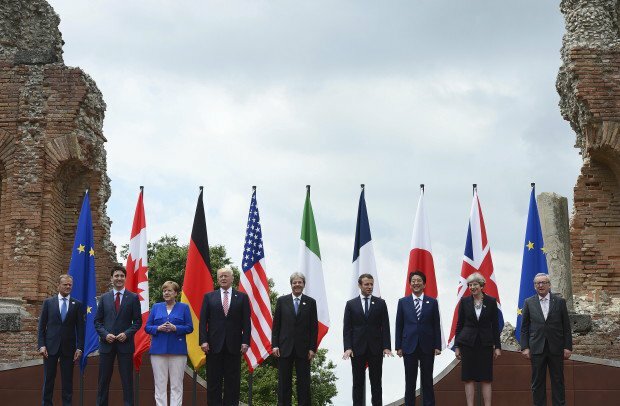 The two-day G7 summit on Sicily June 26-27 pitted the US president – whom the German Chancellor Angela Merkel did not mention by name – against the leaders of Germany, France, Britain, Italy, Canada and Japan on several issues. But while six of the seven renewed their commitment to the 2015 Paris accord on climate change, Trump said he needed more time to decide. The Paris accords were “not just any old agreement, but a central agreement for shaping globalization,” the German chancellor said, stressing that there were at present “no signs of whether the US will stay in the Paris accords or not”. CLEVER WAY OF EXPRESSION==LOVE IT—BUT THEN, I AM BIASED AS A LIMERICK WRITER! Previous Previous post: There she lies! Hillary Clinton commencement speech at Wellesley College, a Limerick. Next Next post: Covfefe the Paris accord! A Limerick.